In the distant suburbs of Toronto, the latest in the wave of Canadian basketball prodigies continued their quest to join the invasion of a sport long dominated by their southern neighbors. The ballers ran through offensive drills under the watchful eye of some of their country’s top coaches, and a few NBA scouts. They effortlessly sprinted across the luminous home court of Athlete Institute Prep, finishing many trips up the floor with crisp dunks. Later, they ran through a complex series of shooting drills that usually ended with the sweet sound of the ball snapping through the net. 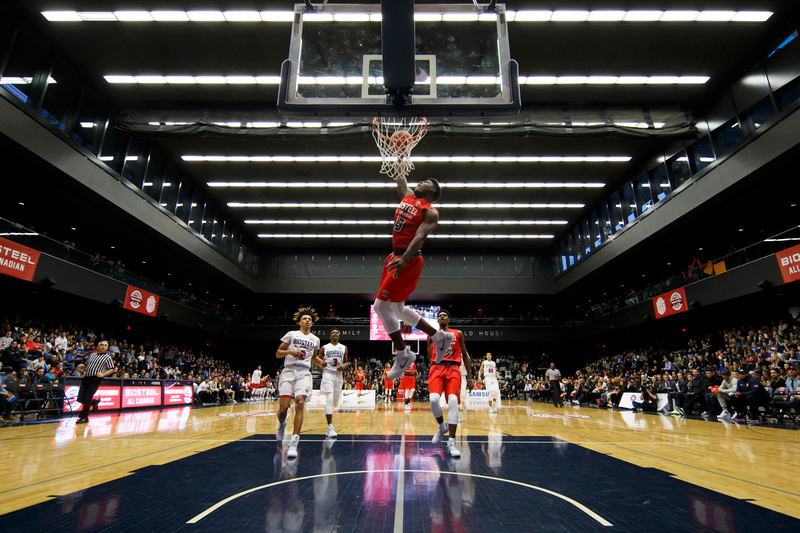 The players were practicing for the BioSteel All-Canadian Basketball Game, a showcase that in its three-year history has come to rival the McDonald’s All American Game when it comes to the sheer talent on display. 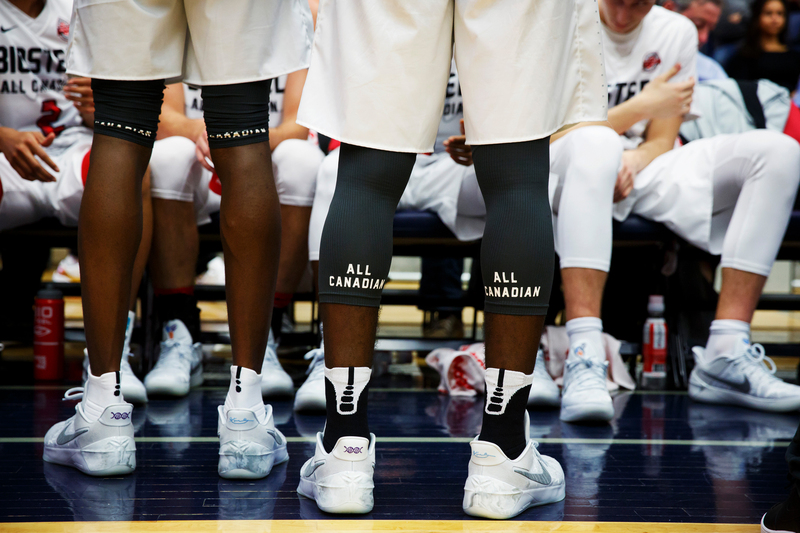 The players are among the best high school juniors and seniors in Canada, which these days is to say they are among the best high school basketball players in North America — or anywhere in the world. Almost all of them are ticketed to hoop for major college programs: Syracuse, Butler, Pitt, Oregon and Virginia Tech are among the schools these Canadian players will be representing in the fall. Two players who could not make the game are headed to Kentucky and Iowa State. The increasing level of talent is proof of the skyrocketing popularity of basketball in Canada and the rapidly improving skill of its new generation of players. Scouts and coaches agree that Canada in recent years has substantially narrowed the once yawning talent gap with the United States. Increasingly, major universities and the pros see Canada, particularly the Greater Toronto area, as a basketball recruiting hotbed on par with, or even surpassing, cities such as New York, Chicago or Philadelphia. 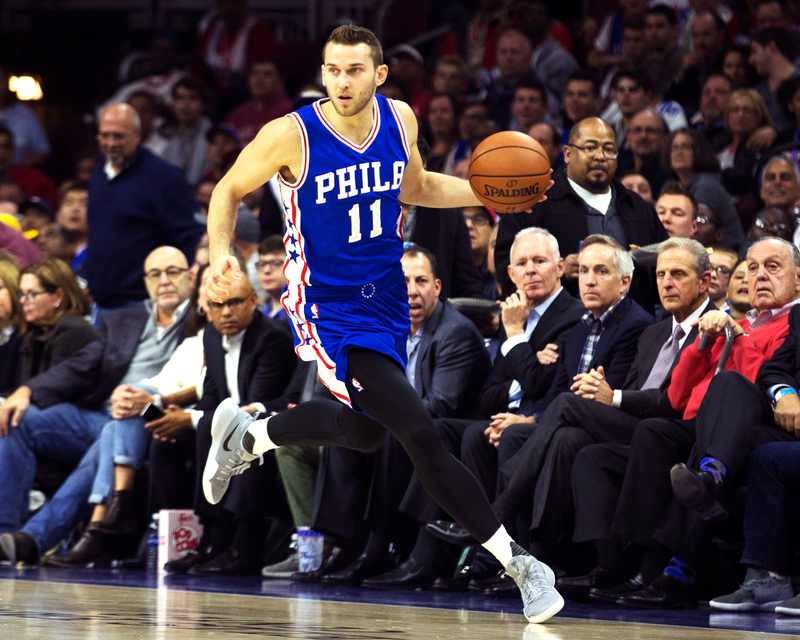 In all, there were a dozen Canadians in the NBA at the start of the season, the highest number of any country outside of the U.S., according to ESPN statistics. France had 10 and Brazil had nine. 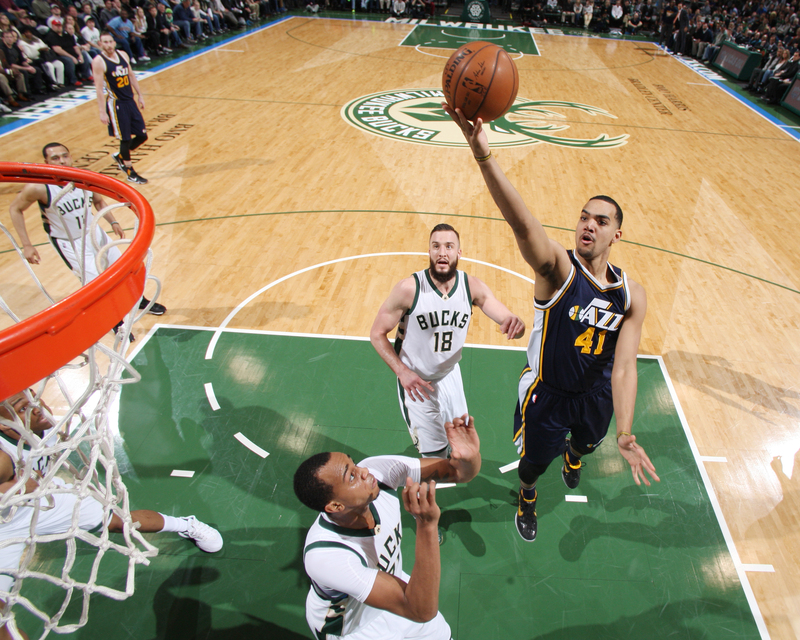 Besides the high draft picks mentioned above, Joel Anthony of the Spurs, Tyler Ennis of the Los Angeles Lakers, Andrew Nicholson of the Brooklyn Nets and the Dallas Mavericks’ Dwight Powell are all from Canada. That is a remarkable number for a country where hockey was once the undisputed king of sports. Just a decade ago, only three Canadians — Steve Nash, Joel Anthony and Jamaal Magloire — were in the league. There were about 30 Canadians playing Division I basketball a decade ago, but by last season that number had jumped to 114. Leo Rautins, a broadcaster for the Toronto Raptors, played at Syracuse and became the first Canadian selected in the first round of the NBA draft when the 76ers chose him in 1983. Canada has had top players in the past, he said, but what he is witnessing now is entirely different. Team White players in a time out huddle during the 2017 BioSteel All-Canadian Game at University of Toronto. The growth of basketball in Canada has been so explosive that some say the sport now threatens hockey’s reign as Canada’s game. A recent report by Solutions Research Group (SRG) in Canada found basketball to be the second-most popular sport to follow among Canadian millennials, behind hockey. The firm’s 2014 Canadian Youth Sports Report found that basketball has the second-highest participation for team sports among children between ages 3 and 17, behind soccer and ahead of hockey. The roots of basketball’s growing popularity in Canada spread in several directions. First there is the fast-growing diversity of Canada, where more than 1 in 5 residents are now foreign-born. Many first-generation Canadians are from China and the Philippines, and basketball is their favorite sport, according to the SRG survey. 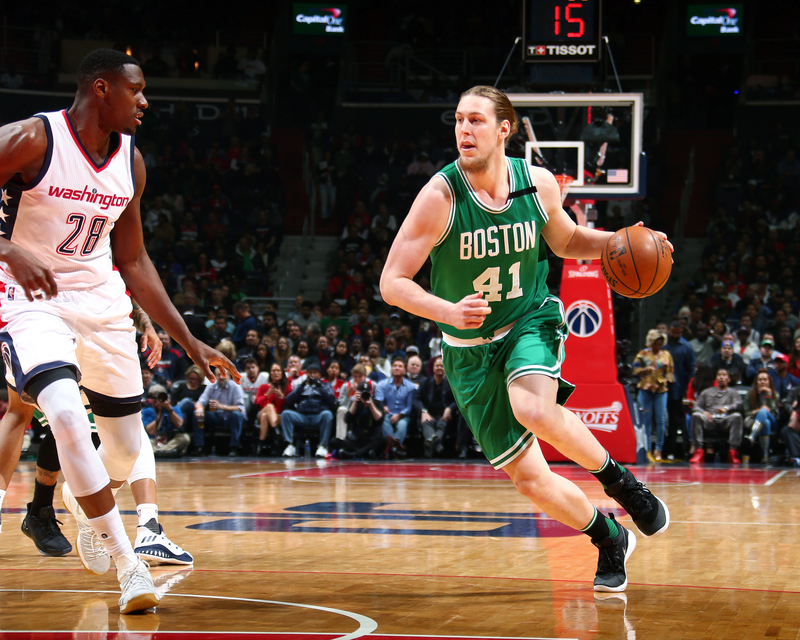 Many other immigrants are from the Caribbean, Africa and Eastern Europe, and they often embrace basketball because it is popular back home, or because they relate to the pace and cultural style of the sport. The BioSteel game included players whose families came from Jamaica, Uganda, Nigeria, Lithuania, Serbia, Croatia and South Sudan. Toronto’s Marcus Carr laughs with teammates during a timeout during the 2017 BioSteel All-Canadian Game at University of Toronto. Basketball also has thrived in Canada because of the wide appeal of the Toronto Raptors. The city’s NBA team, which played its inaugural season in 1995, is now a civic fixture. On average, more than 19,800 fans pack the Air Canada Centre for each home game, the third-highest attendance in the league behind only the Chicago Bulls and Cleveland Cavaliers. Toronto native and hip-hop mogul Drake is a regular, cheering on the team at courtside, which adds to the Raptors’ appeal among young people. Thousands more fans routinely jam the plaza outside the arena, known as Jurassic Park, to watch Raptors home games on giant screens. Toronto Raptors’ DeMar DeRozan watches from courtside as Canada’s young talent takes part in the 2017 BioSteel All-Canadian Game at University of Toronto. The game caps off a weekend showcasing some of Canada’s top homegrown talent, many of whom will be heading off to NCAA Division 1 Colleges in the States. In its early years, the team was propelled by undersized guard Damon Stoudamire. Later, Vince Carter became the face of the Raptors and his high-flying style of play drew new fans to the game, even though the team was not a consistent winner. In recent seasons, the Raptors have become a regular playoff team, cementing the team’s connection to the city and all of Canada. Many fans now coming of age to buy tickets and go to games have no recollection of Toronto without professional basketball. That has helped spawn a wealth of recreational leagues, Pro-Ams and youth basketball outlets, including some of the best Amateur Athletic Union teams anywhere. Montreal’s Luguentz Dort dunks during the 2017 BioSteel All-Canadian Game at University of Toronto. For Tony McIntyre, director of basketball operations at Athlete Institute and founder of one of Canada’s top AAU teams, the growth of Canadian basketball has been very satisfying. It was something that skeptics told him would never happen. McIntyre started coaching youth basketball outside Toronto nearly two decades ago. He played a year of high school ball and wanted to help his young sons learn the game. Several years later, he formed his first AAU team, Bounce, hoping to create a vehicle to help his children and more Canadian players get scholarships to play in the States. At first, some of his friends thought it was a pipe dream. “People said a bunch of Canadian kids would never get scholarships,” McIntyre recalled. It did not take long to prove them wrong. Playing in tournaments across Canada and the U.S., he had great success. Bounce was winning regularly, and often the team would run up against another Toronto-area team, Characteristics Inspiring Achievement, or CIA, in championship games. The two teams eventually merged, and a Canadian powerhouse, CIA Bounce, was born. Before long it had a coveted sponsorship from Nike, which covered the cost of travel and gear, and the team became one of the top AAU programs in North America. McIntyre claims that all of the players from CIA Bounce’s elite team have earned college scholarships. 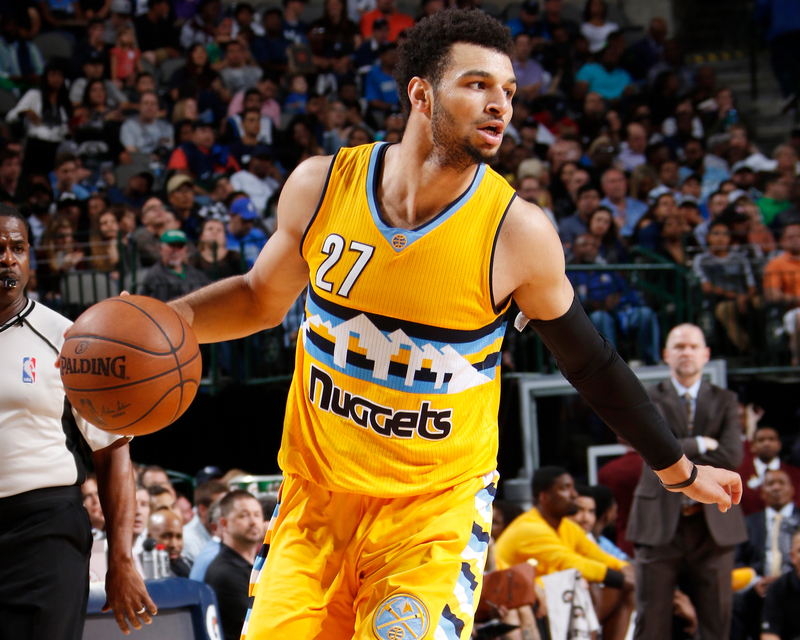 A fair number have also gone on to the NBA: Tyler Ennis of the Los Angeles Lakers is McIntyre’s son, and other program alumni include Thompson of the Cavaliers, the Timberwolves’ Wiggins, the Raptors’ Joseph and Murray of the Nuggets. Early on, McIntyre said, the players would be extra hyped to play against U.S. players, who often were skeptical of the skills of their northern neighbors. For years, nearly all of the top Canadian ballplayers went to prep school in the United States, where they could hone their skills against the stiffest high school competition. That is still the case for many, but now there are similar options closer to home. There are up-and-coming teams in Quebec and British Columbia. But for now, Toronto is still dominant, McIntyre said. Students at Athlete Institute, a residential athletic training facility, attend a local public high school but play for Athlete Institute’s basketball team. The facility offers structured workouts, planned nutrition and physical therapy to facilitate its robust game schedule. This year, the institute’s 6-foot-9 Oshae Brissett, who transferred back home from Findlay Prep outside Las Vegas, was voted the top high school player in Canada. He is ticketed to play for Syracuse in the fall. Brissett said seeing people like Maker and Murray make it to the NBA after going to school in Canada was one reason he decided to return home to finish high school. “Everyone sees that Canada can’t be messed with. We’re good now,” he said. 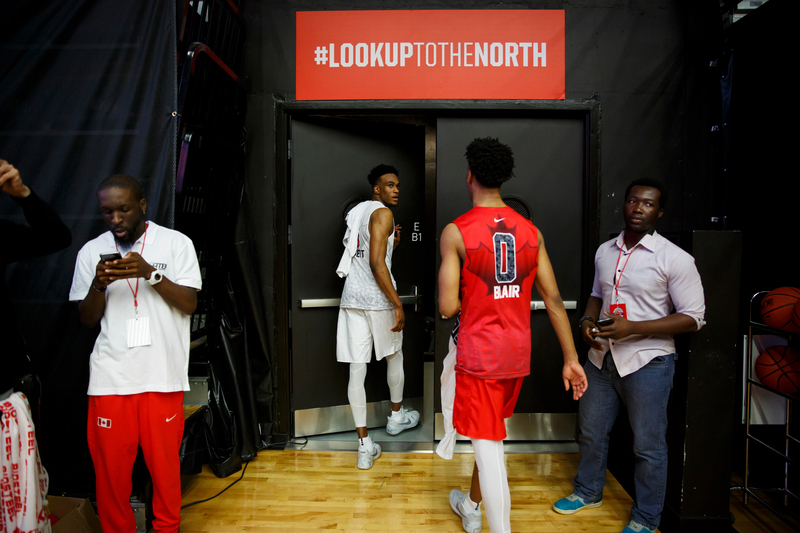 Mississauga’s Oshae Brissett and Brampton’s Jahvon Blair head into the locker room following the 2017 BioSteel All-Canadian Game at University of Toronto. There are many more top players in the Canadian pipeline. 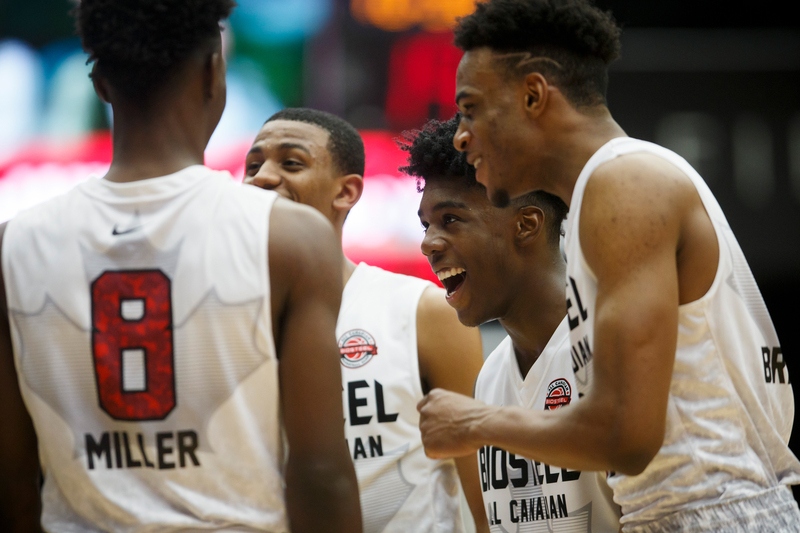 That much was clear when some of Canada’s best high school freshmen and sophomores gathered for the BioSteel futures game. The kids were only 14, 15 or 16, but they were big, skilled and polished. 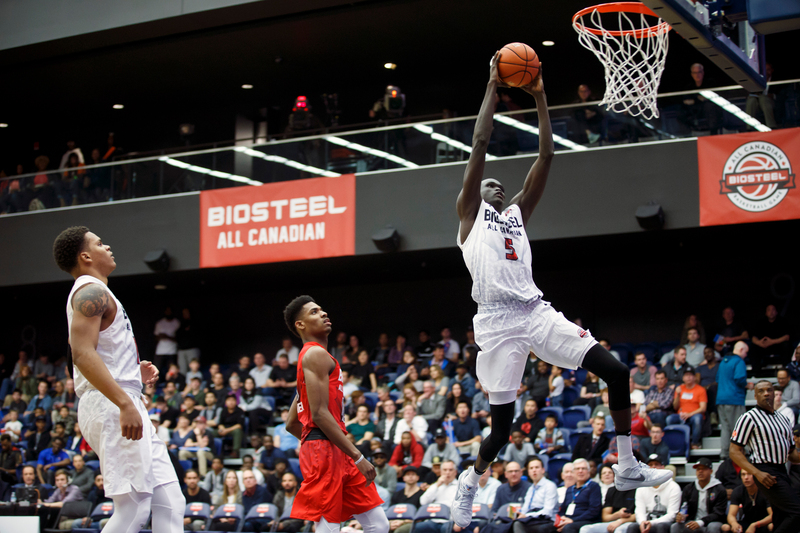 Thon Maker’s cousin, Makur Maker, stands nearly 7 feet tall and showed some of the same ballhandling skill and agility that made his cousin an NBA lottery pick. He scored 22 points and was named his team’s MVP for the game. Australia’s Matur Maker goes up for a dunk during the 2017 BioSteel All-Canadian Game at University of Toronto. The star of the evening was Addison Patterson, a 6-foot-6 guard who can do it all: He shoots deep 3s, throws precise passes, runs the offense, slashes to the hole and rises for dunks and putbacks. Patterson, who is 15, scored 39 points and was MVP for his squad. He is rated as one of the top rising sophomores in North America. The young Canadian player considered to be the best of them all was not even there. R.J. Barrett, a rising junior from Toronto, attends Montverde Academy in Central Florida. Several basketball scouting services rate him as the top high school player in the class of 2019. 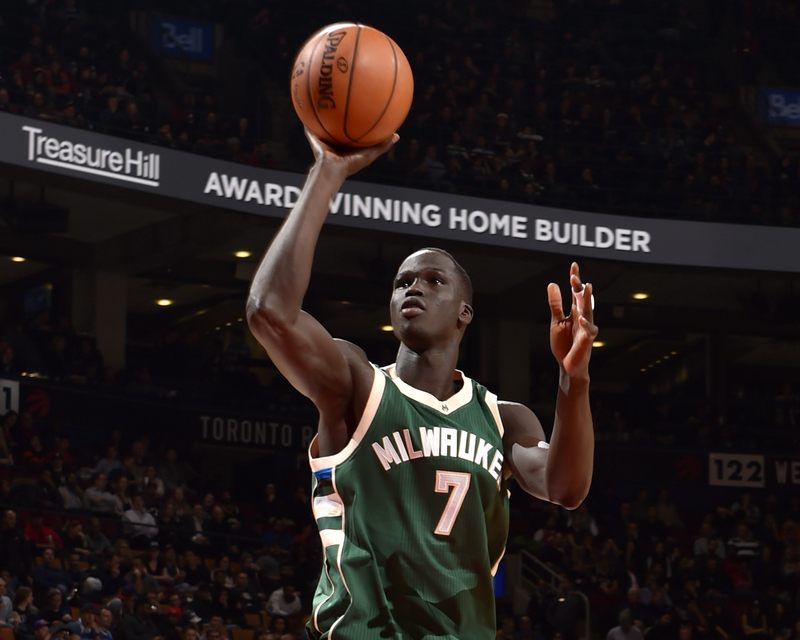 There is wide agreement that the 6-foot-7 shooting guard is the best prospect coming out of Canada since Wiggins. His father, Rowan Barrett, played college basketball at St. John’s University in New York and pro ball in France. He noted that his son is pursuing a much more defined path through the world of elite basketball than existed in Canada when he came along. 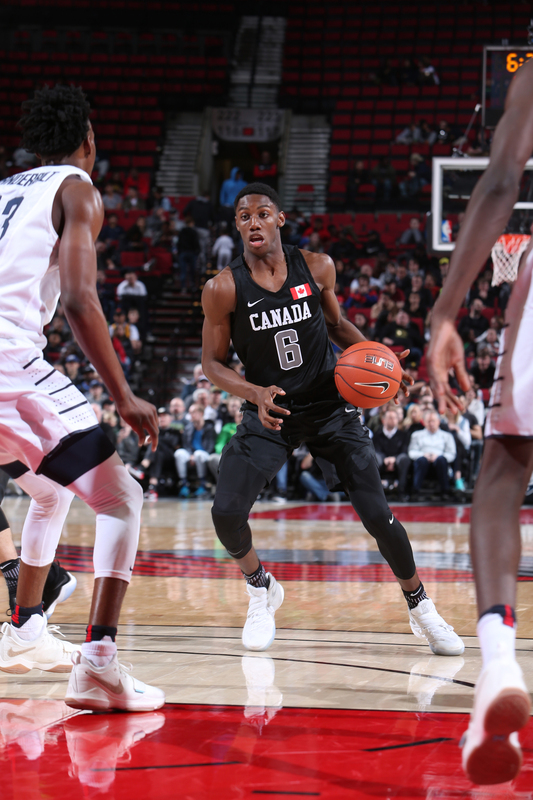 R.J. Barrett #6 of the World Select Team drives against the USA Junior Select Team during the game on April 7, 2017 at the MODA Center Arena in Portland, Oregon. His son, meanwhile, has played all over North America and other parts of the world through the AAU and Canadian teams that play in international completion. 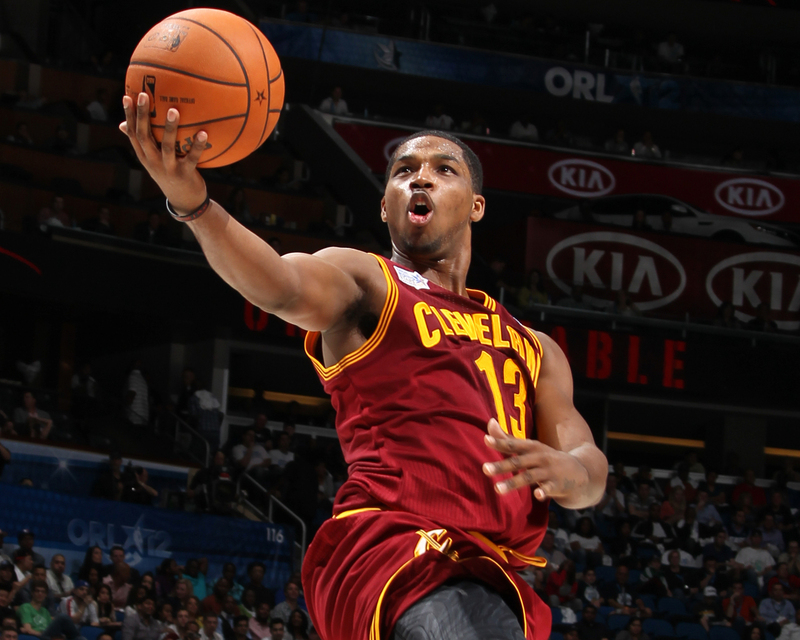 Unlike his dad, he started playing basketball when he was 4 or 5. With his family then living in France, he was steeped in principles emphasized by European players, such as spacing and ball movement. His game developed rapidly when he got back to Canada, and his parents decided to send him to Montverde, the alma mater of NBA players such as Ben Simmons and D’Angelo Russell. Barrett is only 16, but many scouts are predicting that he will follow a similar road to the NBA. It is a prospect that Barrett has been preparing for as rigorously as any American basketball prodigy, even as his father talks it down. Michael A. Fletcher is a senior writer at The Undefeated. He is a native New Yorker and longtime Baltimorean who enjoys live music and theater.